As the world oil markets continue to be in flux, consolidation within the oil and gas industry, especially in North America, is accelerating. The small to medium business sector is seeing significant activity. Companies are being acquired, not only for their customer base, but also for their assets. Organizations that are positioning themselves as acquisition candidates need to streamline their business processes and show enhanced visibility of their assets. This makes them more attractive to prospective acquirers. Using OPP IOT’s RFID based asset tracking solutions, these savvy companies not only achieve 100% visibility of their assets, but also can leverage them to streamline their business processes – processes to accurately check-in/check-out assets to and from jobs, efficiently manage maintenance and inspections of all their equipment, tie all this into their financial systems, etc. Being able to show end-to-end visibility of their assets along with streamlined operations, makes it easier for potential suitors to do due diligence on the companies, thereby making them more attractive targets. Not only do they position themselves well in the M&A markets, they also enjoy the side benefits of reduced operational costs resulting from efficient use of their assets and resources. Once an acquiring company has completed a merger, they have to be able to quickly incorporate the new member into their operations. In order to make the unification efficient, companies standardize on using RFID based asset tracking solutions to maximize visibility of their augmented operations and asset inventory. Mergers lead to additional company locations, servicing an expanded list of regions and geographies. It becomes even more important to know where all the assets are and whether they are being utilized optimally. Leveraging the visibility provided by our RFID solutions, oil and gas companies are able to make decisions about re-allocation of assets amongst the locations based on each region’s business needs. Further, they are able to make informed determinations on new purchases, balancing the requirements of each location. Excess equipment is either disposed of, or is leased out in order to reduce expenses and increase revenue. The rental side of the business can also leverage the RFID based asset tracking solutions, just like the mainstream business. And of course, our solutions can also play a significant role in tracking maintenance and inspections of equipment across the entire company. As new divisions or regions are added, it is imperative that HSE policies of the parent company continue to be enforced and adopted. Our solutions show whether preventive maintenance and safety inspections are being done routinely, and can flag alerts if and when the occasional ball is dropped. RFID (radio frequency identification) is a technology that incorporates the use of electromagnetic or electrostatic coupling in the radio frequency (RF) portion of the electromagnetic spectrum to uniquely identify an object. RFID use in industry is growing. One advantage of RFID is that it does not require direct contact or line-of-sight scanning. An RFID system consists of three components: an antenna, a transceiver and a transponder (the tag). The antenna and transponder are often combined into a single reading device. The antenna uses radio frequency waves to transmit a signal that activates the transponder. When activated, the tag transmits data back to the antenna. The data is used to notify a programmable logic controller that an action should occur. The action could be as simple as raising an access gate or as complicated as interfacing with a database. OPP IOT prides itself in developing project-specific, industrial RFID tags. OPP IOT offers a host of RFID enabled tags ranging from inlays to pcb tags. But, we are most proud of our many tagging options which involve extremely rugged stainless steel and aluminum tags that are not only RFID enabled but have custom graphics/text as well. Our metal tagging can be equipped with Ultra High Frequency (UHF) RFID chips. We are constantly improving our RFID product offering. If your company is in need of solutions for RFID enabling your assets, OPP IOT will work to come up with the perfect tags for your applications. 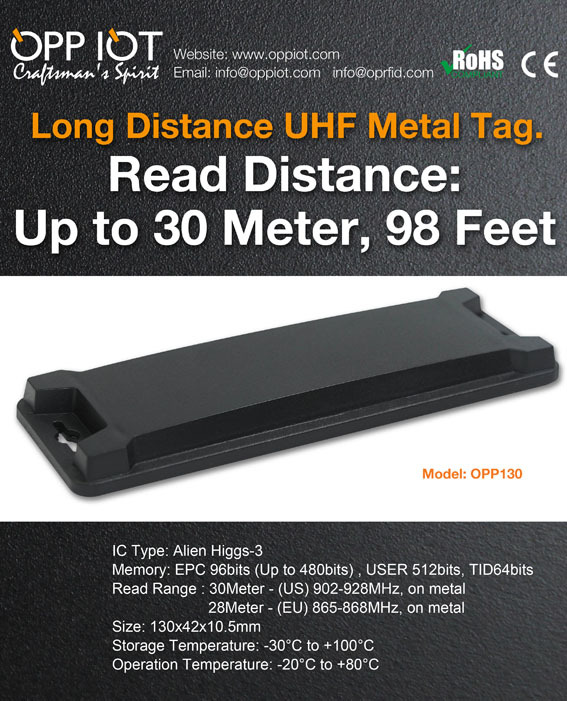 The OPP130 is a durable, super long read range RFID tag used in logistics, warehouse management, large equipment tagging, and any application where read distance is crucial. In addition to having two rivet holes for secure attachment, it is backed with an aggressive adhesive for durable adhesion to most materials. With a fixed RFID reader, OPP130 RFID tag will read at over 30 meters, making it a smart choice for tracking shipping containers in a logistics environment. The long read range also comes in handy when scanning tall shelves. The specially designed form factor allows for a much wider read angle than most tags. The OPP130 RFID tag can be directly screwed on or attached via adhesive to metallic surfaces without degradation in readability.